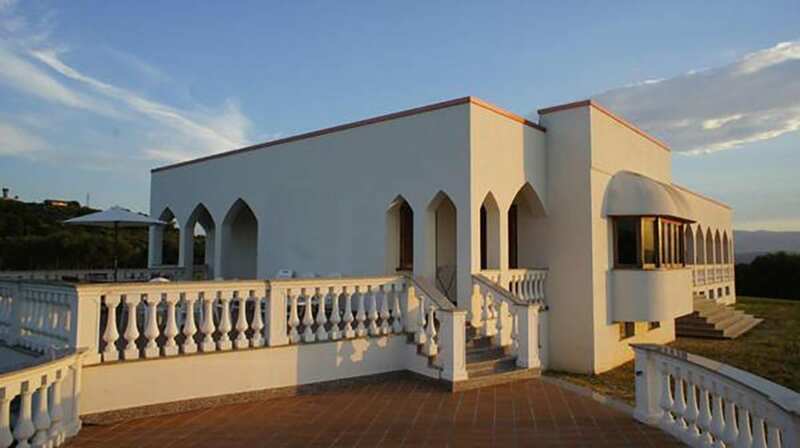 If you are looking for a very affordable, light and airy Abruzzo villa rental for your family to stay at whilst you hit the beach and explore Abruzzo’s famous mountain towns, Villa Adriatica in Pescara’s Montesilvano, sleeps 12 and starts at just 256 euros per night. Villa Adriatica was commissioned in the 1980s by Orsola Pergolari, fabled for being the signora that brought fresh pasta to the country of Bahrain from whence her husband came. What makes this villa unique in Abruzzo is its ageless Moorish-style architecture with all those well thought-out and much-appreciated al fresco dining areas and courtyards that are so often associated with this architectural approach. The villa offers stunning panoramic views, ranging from the Gran Sasso mountains to the north to the Adriatic Montesilvano Marina on clear sun-filled days and nearby Montesilvano Colle to the east. Many families and friends go on holiday and feel on top of each other through a lack of space; here it is the opposite, with contemporary styled, roomy, bedrooms, dining and living spaces that will ensure even the introverts within your group will find a quiet area to relax. The master bedroom has a jacuzzi that is more like an indoor mini-pool and there is plenty of safe outdoor space for kids to run around. The kitchen is modern and well-equipped, a family size barbecue is provided for those who can’t resist the call of the coals whilst on holiday and there is a choice to eat indoors or out on the terrace. Villa Adriatica is happy to arrange the services of a private chef for part or the duration of your stay for those groups that prefer a fully catered holiday. The villa is a convenient 10-minute drive to the airport and 10-minutes into central Pescara. You will need to hire a car for the time you are at the villa. Montesilvano Marina is the nearest beach; if you’d prefer a Blue Flag beach try Silvi, which is just a 20-minute drive. Abruzzo’s slow food capital Citta San Angelo is just a short 15-minute drive away and, for those on the look-out for tasting some great wines made from ancient grapes, the nearest vineyard is Casa Vinicola Monteselva. If you don’t feel like cooking and want to take advantage of good local restaurants that are a short 5-minute drive away, we recommend trying Nini’s in the piazza of Montesilvano Colle which is highly recommended by the family and always receives great feedback from all the villa’s guests for its beautiful setting and consistently great food. Another local family favourite in Montesilvano Colle is BR1 Cultural Space. If you want to stock up on local produce have a look at Ekk Typical which has a spectacular mix of ranges from across the 4 provinces. The market in Montesilvano is open daily every morning nfor fresh fruit and vegetables, meat, cheese, fish and seafood. The beachside Naiadi offers an Olympic sized lido and there is a children’s pool too, visit website. To book directly via the website or send an enquiry to Abruzzo’s Villa Adriatica, click here.